Citing looming retirements and increasing demand, advocates for Maine nurses are lobbying for a bond referendum that would infuse $12 million into training programs in the state. Question 4, a $49 million higher education bond on the November ballot, would earmark $12 million for nursing education programs and facilities to help address a deficit of nursing school graduates. Forecasts from nursing groups have found a gap between expected nursing positions and the graduates needed to fill them. A 2017 survey estimated that Maine will have a shortage of 3,200 qualified nurses by 2025. Lisa Harvey McPherson of the Maine Nursing Action Coalition said its forecasts take into account that half of Maine’s nurses are older than 50 and contemplating retirement soon. “The good news is that we’re making progress,” McPherson said, noting a slight increase in the number of recent registered nurse graduates. But it still won’t be enough to cover about 2,500 open nursing positions forecast by 2025. “It’s still far short of what we need. The challenge before us is 2,500 new nurses in the next seven years is a very big number,” she said. Maine Department of Labor forecasts suggest a shortfall of nurses, although not as dramatically as the nursing organizations suggest. The department expects there will be 944 annual openings for RNs through 2026; the state produced 800 nursing school graduates this year. The nursing coalition, other nursing groups and officials with the state university system joined together Wednesday to urge passage of Question 4. Glenn Cummings, president of the University of Southern Maine, said the $12 million would be used to build nursing labs and classrooms and provide support services for students in nursing. He said other campuses in the university system also are launching initiatives to boost nursing education. Cummings said some campuses have started a program to provide free nursing courses for students with the greatest need. The bond package would pay for doubling the size of a nursing simulation lab at USM and building a health sciences campus in Fort Kent, he said. The state also has adopted other programs to help get more nurses into Maine hospitals, assisted-living facilities and other places where they are needed. Maine is the oldest state in the country and is expected to see increasing demands for nursing care. For instance, a bill passed last month allows returning military veterans with nursing experience to bypass state education requirements and immediately take the state exam to become licensed practical nurses. St. Joseph’s College in Standish received a $1.5 million grant last year to help set up a new nursing academic center, and St. Mary’s Health System in Lewiston has had success recruiting nurses from the Philippines to fill dozens of vacancies. 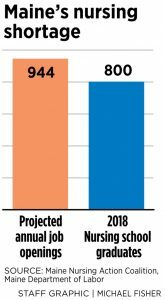 Nursing is one of the few bright spots in Maine’s job picture, with the state Department of Labor forecasting that 1,626 jobs for registered nurses will be created through 2026. The same report sees steep job losses for office workers, cashiers and salespeople in retail with, overall, only about 100 net jobs created in the state through 2026. Nationally, nursing jobs are expected to grow by more than 400,000 by 2026, according to the Bureau of Labor Statistics. Pay is above average, with the median wage nationally at about $70,000. 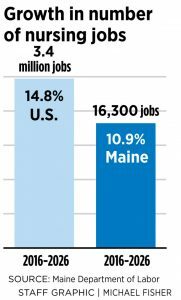 In Maine, there are 14,200 nurses working, with a median wage of $65,890, the Bureau of Labor Statistics said. About a third – 4,520 – work in the Portland-South Portland metro area and the average wage there is closer to the national figure, at $69,220.